With black chadors over their uniforms, officers of Iran’s “guidance patrols” are a scourge for Iranian women who want to wear bright colours and push the limits of the Islamic Republic’s dress code. But some Iranian women are fighting back, using their smartphones to document what happens once they are arrested. The Gasht-e-Ershad (guidance patrol) is Iran’s morality police. Part of the regular police force, its male and female officers are charged with enforcing Islamic codes in Iranian society, and have the power to arrest people they think are violating them. While the total number of its officers is unknown, a spokesman said the force made 207,000 arrests in 2013, and notified a total of 2 million women that their hijab (Islamic dress) was not correct. Under Iran’s Islamic law, women are supposed to cover everything except their face and hands. 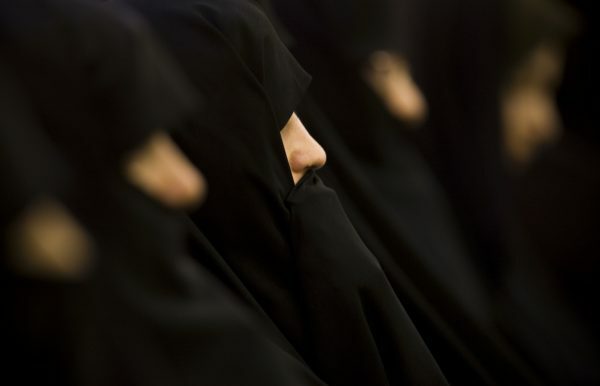 Conservative women wear the chador – a black garment that covers the head and goes down to the ankles. But other women choose to wear a scarf that covers their hair, a knee-length “manteau”, or coat, with sleeves to the wrist, and a skirt or trousers. In recent weeks, a series of videos has emerged on social media showing what happens when women are arrested by the morality police. Many of the videos – filmed surreptitiously inside the patrols’ white and green vans, and inside police stations where women are questioned – have been posted to a Facebook page called “My Stealthy Freedom”. Our Observer Bita (not her real name) is a 19-year-old engineering student. She was arrested by a Gasht-e-Ershad patrol while out walking with a friend in east Tehran. She discreetly filmed the arrest on her cellphone, and posted her video on the “My Stealthy Freedom” Facebook page. “I was walking in the street with one of my female friends when we saw a Gasht-e-Ershad van. There were three armed male officers, a male soldier and three female officers. They didn’t like what we were wearing and asked us to get in the van, saying if it was our first offence they’d let us go. We didn’t want to get in because we knew they were lying, but they insisted. After they picked us up, they continued driving around looking for women with bad hijab. At one point, we stopped in a busy street and they tried to arrest a woman. But she began shouting and the male officer said to the female officers, “Forget her, people are going to start gathering.” Another time people began filming on their phones and they gave up. “They ended up taking us to a police station. One of the female officers there told me I was right, my hijab was correct. But then she read the report and said I was apparently arrested because of my hair color – my hair is dyed blue. They also said the buttons of my manteau were undone. That’s a lie. The female officers at the station were even harsher than the ones on patrol. They insulted us non-stop, saying things like “Shut up” and “Do you want a slap?” Some of women were frightened and started crying. I was just angry – it was three hours of insults and humiliation. They took our cellphones and asked for our ID, our address, and the name of our university. They took photos as if we were criminals, and took videos of us, telling us to explain on camera why we had been arrested. They told us we’d have to pay a fine. I don’t know how much because I haven’t received the summons yet. “The problem is we’re never sure what’s forbidden and what’s not. Women are arrested because their sleeves are too short, or their manteaux are a bright colour like red or yellow. Or they’re wearing torn jeans, or a hat instead of a scarf or chador. Or they dye their hair a colour like blue or pink. Or they have a tattoo. Or long boots. Or heavy makeup. Or leggings. And yet Iran wants to be considered a modern country? Go figure. They are only marginally better than the Saudis retarded Islamic social disorder. And more power to the females that have the biggest balls in Iran. And those here who defends Hezbollah expect later the same treatment of women and even men at the rules of Wilyat ald Faqih. The Iranians criticizes the extremism of Daesh but they are no different than them in reality. What kind of Iran is this? the rules of 1 century and the control of masses by these thugs in Tehran. No wonder some Iranian women in the US were happy go lucky hate to say it. On the night of August 1, the International Olympic Committee (IOC) announced that in 2024 the Summer Olympic Games will be held in Paris, and four years later in Los Angeles. Paris and Los Angeles were named the capitals of the Olympic Games in 2024 and 2028 as early as 11 July. But then it was not yet clear in what order these cities would host the Olympics. July 31, Los Angeles formally put forward an application for the summer Olympic Games in 2028. The Egyptian authorities reported on new measures to stabilize the economy. They include changes in the rules for the distribution of food cards – for those to whom they have not previously been issued. The reform will not affect more than 20 million Egyptian citizens who already receive cards. New rules limit the number of recipients of cards in the family. Also, restrictions on income are introduced for those who wish to receive subsidized food. According to the Ministry of Supply, one family will be issued cards for no more than four people. The maximum income will be 1,500 Egyptian pounds for employees and 1,200 pounds for retirees. At the end of 2016, Egypt received a loan from the International Monetary Fund in the amount of 12 billion dollars. The condition for issuing the loan was austerity measures and the abolition of control over the exchange rate. As a result, in November 2016, the pound lost half its value.